Why is the stuffed corpse of a great philosopher at University College London? Sometimes tradition is a burden. Sometimes, it's a little treasure. A university displaying a dead dude in a box is an example of when it's a treasure. 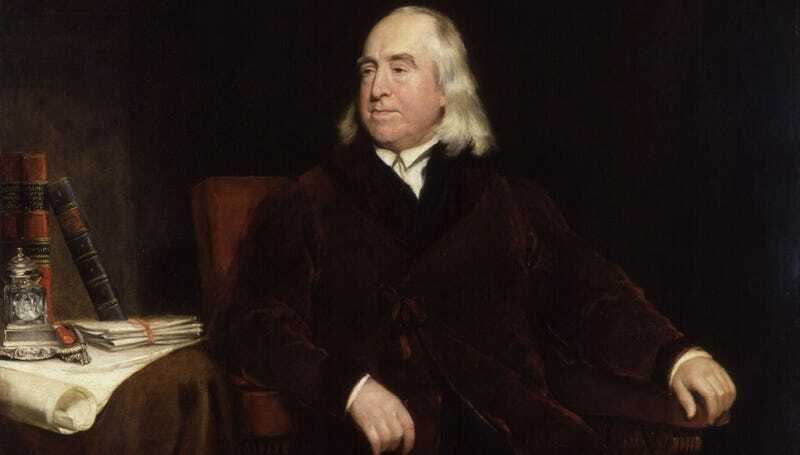 Jeremy Bentham was born in 1748, started writing as a toddler, and apparently didn't stop until he dropped dead in his eighties. During that time he produced documentation as to how far he was ahead of his time. He's known as a founder of utilitarianism - the philosophy that resources should be used as practically as possible, with the end goal of that practicality being the "greatest amount of happiness for the greatest number of people." If that sounds a bit ominous to some, Bentham interpreted the philosophy as very humanitarian. He condemned the death penalty, physical punishments, punishment for homosexuality. He wrote about the necessity of relief for the poor, universal suffrage, and animal welfare. But it was his final declarations that raised the most eyebrows. Bentham specified that his body be used as much as possible. This included an illegal educational dissection - since it was only officially legal to dissect executed prisoners. He also wanted it displayed as a monument to his beliefs, and since by that time he had become an icon, people agreed. His internal organs were removed, as was his head. His body was stuffed with lavender, straw, wool, and cotton. His head was meant to go back on his body, but attempts at mummification, while effective in mummifying the flesh, made it look too gruesome. He was dressed, his head replaced with a wax replica, and he was ready to go. He was kept by a fellow utilitarian for eighteen years, before University College London, the college he help found, acquired him. The body was on public display, and the head on a somewhat more private display for over a hundred years. Over time, both body and head were swiped as pranks so frequently that at last the college put the head in a safe and made the body only viewable on specific days or by special appointment. That would undoubtedly have disappointed Bentham, but we have to be practical. And they still get some use out of him. It's said that at special meeting of the college council, the body is wheeled in and recorded as "Jeremy Bentham: present, but not voting." You can see a rotating display of Bentham's body, dubbed his auto-icon, at the University College London site. Via UCL twice, and Find a Grave.